Pidove let out a big yawn as he stretched his wings after his long nights sleep. He had found a nice place that was out of view to any passing flying infected, and hard to get to by land infected. It was a ventilation shaft at the top of one of the large buildings that made up Hearthome City. He knew very little of this place since his mother never talked about it, or any other places in Sinnoh. He wondered what this place would have looked like with people walking all over the place, laud and noisy probably. He much rather preferred it the way it was, nice and peaceful. Stretching his wings again Pidove walked out of the shaft, looking in all directions before taking to the sky. The breeze was nice as it blew through his feathers as he dived down to ground level in search of something to eat that wouldn't try to eat him. Ever since he got separated from Mandabuzz, he has been fending for himself, which is really something for someone his age. And level. He slowed down when he got closer to the pokemon center. He had found food in the red building before, so he thought he would go look for more food again. Flying through one of the broken windows, he began to glide to the room where he had found the food before. Coming to a stop and landing on the ground just outside the door. He hopped into the food storage room and saw that there was an open bag of those strange pellet things that he had tried in another center and really liked. There where about three bags full of them, and he just started to stuff himself on the one that was open. Not really paying attention to the things around him other then the food in front of him. It was really a quite lovely morning. You wouldn't expect things to still be somehow lovely, what with all the sick and dead (as well as undead) Pokemon, but the sky was clear and the sun shone brightly. Talon sighed wistfully. The city wasn't his place of origin, not by a long shot, but it was starting to feel almost like home to him. The dark blue-feathered Pokemon peeked out from his perch, a small crevice tucked into the side of a building with a round top. Every Pokemon had needs, even during the epidemic. Talon's stomach gurgled and the perky Pokemon surveyed the sky, checking to see if there were any infected-looking Pokemon flying about. He only really needed to worry about those with wings or those that could levitate. There wasn't much that those who were limited to the ground could do to him. Deciding that things seemed safe enough, he launched himself from his safe spot atop the building, and soared, circling in search of food. Food had become more and more scarce with each passing day, but there was always something. It was just a matter of who you knew or how good you were at looking for it. As he circled around the red-topped Pokemon Center, he spotted a little Pidove forcing his way into the building. Hmmm, maybe this guy knows where food is! thought Talon, clacking his beak slightly in excitement. He hoped he wouldn't have to hurt the small Pokemon, but desperate times called for desperate measures. Entering in through the same way the Pidove had, through a broken window, Talon watched as the other bird Pokemon flew down the hall and into a side room. A side room that was giving off a very tantalizing aroma, Talon noted. Almost unable to contain himself, Talon followed, his hunger reaching a new height. He rapped his beak sharply on the door to grab the Pidove's attention, as it was currently stuffing its beak full of delicious(in Talon's opinion) looking pellets. "Hi there," he said, trying to keep his voice level though it broke in the middle of the second word. He really was hungry. "Would you mind terribly if I joined you? I'm hungry..."
Pidove was happily enjoying the pokemon food. He had almost disappeared completely into the bag as he ate. Though he stopped when he heard someone talk. "Hi there." He poked his head out of the bag to see a dark bluish bird with a funny hat. The young Pidove tilted his head, his face covered in small crumbs from the food. "Would you mind terribly if I joined you? I'm hungry..." Pidove smiled and nodded his head, outstretching his wings. "I no mind." He said before going back to eating himself. Mandibuzz had always called him a little glutton cause he was always hungry, but he was a growing bird, so he needed lots a food. When the Pidove spoke, Talon realized that the little bird Pokemon was far younger than he first thought. Obviously since it was still just a Pidove, it was young, but Talon had assumed that it was just the runt of its clutch of eggs! Talon shuffled along the floor awkwardly, not wanting to fly into the room in case he startled the other Pokemon. He didn't know what would and would not upset the Pidove, who he guessed was little more than a hatchling. "Thanks, kid," crowed the Murkrow, dipping his beak into the nearby bag of pellets. As he pecked away at the Pokemon food, he felt his hunger ebb away, though it seemed as though the Pidove next to him would never be full. He stared at the fledgeling for a minute, wondering if it would ever stop eating. When it didn't, and just kept pecking away in his feed bag, the Murkrow decided to intervene. "So... this is a nice thing you've got goin' here for you, kid. I'm Talon. Do you live alone? You seem pretty young for that, you know." Talon was a very nosy creature; he loved being beak-deep in anyone else' business, and this Pidove was interesting to him. He wondered how such a little Pokemon could survive alone, if it was indeed alone. Then again, he assumed that it must be. After all, what kind of mother would send her baby out into a diseased world to forage for food alone? Pidove had finally had his fill and ploped himself down, letting out a satisfying sigh before turning back to the strange blue bird that had intraduced itself as Talon. Once again Pidove smiled and stood up, opening and closing his wings. "I Pidove. I here all by myself." He chirped before folding his wings agains and tilting his head, his smile still plastered on his face. This was his first time meeting another flying pokemon that didn't try to eat him, or another pokemon that didn't try to eat him peariod. Talon chuckled at the Pidove's excitable nature; the kid was pretty adorable. The Pidove had finally finished eating, so now they could really talk... though it didn't seem like the Tiny Pigeon Pokemon was too great at talking just yet. Talon's eyes widened when he realized what the Pidove had said. "Wait, so you're all alone? You don't have any mother or father?" Talon fretted. He wasn't sure if his conscience would let him leave the little Pokemon if it was true. He wouldn't want the Pidove to get ripped apart by undead, almost any of which would be much bigger and faster than it. "And, just Pidove? You don't have a name?" Though, he supposed that so young a Pidove might not have a name yet, and since it was alone, it probably didn't have a guardian to name him. Talon chuckled and Pidove looked at him wondering what was so funny. He thought what he said was pretty good considering how hard it was for him to say what he wanted and have it make sense, but then its attitude changed when it started asking all these questions that the little pigeon could hardly keep up with what he was saying. "Wait, so you're all alone? You don't have any mother or father? And, just Pidove? You don't have a name?" "all lone." He said, his wings drooping and head low, but soon raised it back up and folded his wings again. "No name." He added, looking back at the door then at Talon. Talon noticed that the little Pidove seemed to be having trouble keeping up with his rapid fire questions, and he stretched his wings. "Sorry, I didn't mean to turn this into a twenny questions thing, haha," he awkwardly apologized. He never had been good at apologies; He supposed maybe it had something to do with him being a dark-type Pokemon, or maybe just because he had lived most of his life alone, save for his nest-mates. The often too-curious Murkrow frowned; that really wasn't the answer he was looking for. "I'm very sorry you're alone, Pidove. It must be hard living with no one to look after you..." he trailed off, his words hanging awkwardly. He followed Pidove's glance to the door, suddenly nervous. Had the little Pokemon spotted something? Quinn had safely hidden himself away in the furthest corner of the Pokemon Center within Hearthome, nestling himself between the PC Box Computer and the wall. Though the night was long, the Wingull had finally been able to safely drag his favorite book - Adventures of Huckleberry Quinn - of which he was named after, into the Pokemon Center for a safe reading. It was hardly anything to say that the bird was content with reading away the day. Admittedly, the reason why Quinn had stolen this book from the nearby house's shelf was to get his mind off of the epidemic; he had eaten a few Oran berries and drank water from the dwindling fountain outside, but the scourging powers of this pandemic sickened the Wingull to the point that he would lose his appetite. Reading had always made him feel better, however. Lifting one talon to flip the next page of Huckleberry Quinn, he clucked to himself in peace. Or at least, until a tweet soon came from behind the counter, and noises and shuffling could be heard. Ah...? The Seagull Pokemon brought his wings up close to him, hear a little more movement and sound as two Pokemon conversed. One was off on grammar (but that could be because he was young), and another was rather polite and respectful. While Quinn listened in to their conversation, he felt as if he were intruding, and that was one thing he did not want to be caught doing. But... Truthfully, the Wingull was so used to being by himself that he found it odd to suddenly be with others. After ruffling his feathers in disarray, the water type decided that he might as well introduce himself and let it be known that he was in their midst. Pushing his book safely into its corner, Quinn flapped his wings and landed gracefully upon the counter, looking at two birds in question - one was a teeny tiny Pidove that he swore was the cutest thing he had ever seen, and the other was a Murkrow with bandages wrapped on his talons. Cawing in a friendly manner, Quinn did his best to seem friendly with a genuine nod of happiness. "Hello! I'm Quinn, and I assure you, I'm alive!" It had been a rough night for Zoroark... Well, every night was hard for him. He was easily at a level that allowed him to stay clear of the infected monsters, but he missed his trainer so much that it broke his heart a little more each day. That morning was no different. While he slept, Zoroark had disguised himself as a huge Lugia, to keep the threats away from him. As Zorark awoke, lifting his actual head and allowing the illusion to dissapear, he earerly glanced around him for his beloved green haired trainer. However, Zoro had found refuge in the attic of a house that had been nearly destroyed, exactly half of it left standing and making it possible for anyone on the street to see him, and it would have been odd to see N squished inside of the small space with the Zoroark. As the terrible memories set in, Zoroark whimperd as tearless sobs wracked his body with greif. Now all he had left was the teenager's necklace. Zoroark clentched it protectively with the claws in mis hand. The chain was wrapped around his wrist so that Zoro could easily hold the strange shapped planet-like pendant on his sensetive palm. It was all that he had left of him. Zoroark shook his head. He needed to move on, if only enogh to find food. Zoroark clutched his collasped in stomach as it grumbled angerly, demanding fuel. He sighed. Time to get up then. Zoroark stood in the small part of the attic, stretching his arms and cracking his neck. Zoro walked to the edge of the floor where it just ended from some sort of chaos before and, clutching the necklace protectively in his hand, jumped easily to the ground, landing gracefully on his feet. Straightening up, Zoroark automatically let his illusion ability take over, giving him his favorite discuise- a starvia. To anyone whom saw it, he was a starvia, gliding just above the ground, as Zoroark walked in all reality. He moved through the city, following his sharp nose. He walked past one of the very few buildings that had little or no structural damage: the Pokemon Center. And as he moved loser to it, he came to realize two things: first, there was the strong scent of food coming from the building, and two, he could hear... Voices! Not the strangled cries of infected but... Real voices!! Zoroark was so excited by the latter that he entered the building through a broken window- his illusion easily flying through while he jumped swiftly- his hunger temporarily forgotten. And what met his sight was so wonderful, the Zoroark could have danced. Not only was it real living pokemon, but they were all birds! A small Pidove, native to his region, was by an open bag of food talking with a Murkrow, and there was a Wingull ob the counter speaking to the pair. A huge grin plastered itself as I absorbed the sight. Bird pokemon had saved my life as just a baby and I was forever in their debt. I disolved the illusion, bowing gracefully as my true form was revealed to the birds. "Greetings fellow living Pokemon! Mu name is Zoroark. Please do not be alarmed as I am not here to harm any of you." I smiled kindly, meeting all of their gazes as I stood to my full, towering height. But my introduction was lost as my stomach called out in almost pain and I immediatly doubled over, clutching it painfully. With a sheepish grin of apology, I looked to the young looking Pidove and Murkrow. "Pardon myself, but would you mind sparing just a bit of your food stock?" Talon turned, tilting his head and opening his beak in what he hoped was a friendly expression, towards the newcomers. He looked back towards the Pidove, checking to see what it was thinking with the appearance of the two new Pokemon, but the Tiny Pigeon Pokemon's face wasn't hinting at many emotions. He took a hop away from Pidove, towards Quinn. He decided that he liked the friendly-seeming Wingull. "Hello!" He crowed, blinking and turning so he would also be introducing himself to the Zoroark. No use repeating himself, he assumed. "I'm Talon and that's Pidove," he pointed to the little Pokemon with one wing, "It's nice to see another living Pokemon, it is!" He turned his view to the Zoroark, addressing his question. His eye couldn't help but linger on the necklace it held, it was just so shiny - Talon liked shiny things. "Two living Pokemon, actually! It's not my food, but I don't think it's Pidove's either, so go ahead!" He hopped to one of the unopened bags and dragged it over to the large bipedal Pokemon, slashing it open with one quick movement of his beak. The Murkrow, whom had introduced himself as Talon and the Pidove merely as its species, warmly greeted him and a Zoroark that had came in a few moments later. Quinn flapped his wings happily, waddling across the desk to look upon the bags of Pokemon food that the two other birds had found. The Seagull Pokemon then blinked his eyes in delight as Talon invited them to come and eat. "Greatly appreciated, very much so!" Truth be told, Quinn disliked the taste of berries in general, how wet they were as it slid down his throat, but he endured his objection to the fruit in the expense of hunger. But what a treat it were for them to share the delicious pellets! Hopping off the counter and towards the Pidove, the Wingull waved a hello as he voraciously took some Pokemon food for himself. Talon had quickly accommodated Zoroark by dragging one of the bags over to the other dark type, ripping it open and releasing its rather yummy contents flow onto the flow. Quinn ate a few more as he looked at the Pokemon that had accumulated fatefully within this run-down Pokemon Center. He watched the tiny Pidove for a moment, taking in how innocent the small bird was, before switching his gaze over to the Murkrow. There were so many stories about how Murkrows had brought bad luck, and even worse stories told by mouth of how a wicked Honchkrow started this ‘infection’, but frankly, Quinn only found that this particular Darkness Pokemon was quite the opposite. And the Zoroark was truly an interesting character; able to change shapes at will? Exciting, yes! “Might I ask how all of you wound up in Hearthome?” He paused for a moment as to let the others mumble over his question, before answering it himself. “I was fleeing from the library in Canalave, but I’ve always found the cathedral within Hearthome drawing me in, and I couldn’t stop myself.” He’s read too many books, knowing that no Arceus was going to appear from the stained glass window and bring forth a prophecy, but one could always dream. And dream of a different tomorrow as another yesterday is wasted. Shaking himself from his reverie, Quinn awaited their responses. It was no use bringing himself down with internal fighting, snagging a few more pellets as he satiated his hunger. The Wingull would freely admit that he was more book smart than street smart, finding that his days within the library only sustained his mind and relinquished his body in the process. Shame burned Zoroark's canine ears as his terrible rudeness. He had just showed up out of no where, introducing himself like any gentleman shoukd, only to end up begging for food in the next sentence! He groaned silently, clutching N's beloved necklace in his hand tightly as he silently cursed his actions. However, thankfully, none of the wonderful bird pokemon seemed to mind. Just another reason that I love these wonderful creatures, Zoro thought fondly as the Murkrow promptly introduced himself as Talon and the child as Pidove. Zoro gave another bow to them. "Nice to make your aquaintance," he repied with a wam smile to them, even including the wingull despite that he had not caught the duel type's name yet. "Two living Pokemon, actually! It's not my food, but I don't think it's Pidove's either, so go ahead!" Talon happily chirped for Zoroark, receiving another fenuine smile from the wolf. Appears that this ill thought of pokemon is shedding his sterotype, like I, and earning his rightful place as an honorable bird pokemon! Zoroark thought with satisfation as Talon took it upon himself to jump gracefully to the other bag of food and ripping the weak papery loth with his magnificant beak. Zoroark immediately crouched down as the food pellets spilled onto the floor. He took a handful of the foul stuff and shoved the food into his mouth, chewing loudly and swallowing whole peices. It had been far too long since he had had food. Hunting was prefered, but Zoroark would take anything at this point. He was literally starving, the pains inside of his body sometimes unbearable and ovious with how his ribs shown and his stomach caved in. He almost forgot that the others were there as he ingested the first thing in at least a week. It was only after eating at least half of the large bag and baving his stomach cramp up slightly from being filled so rapidly that Zoro remembered the others. The dark type immediaty shot to his feet, his entire face hot with embarresment as he regaurded them with the horror that he had embaressed himself so in front of noble bird pokemon. "F-forgive me!" Zoroark chrped out before sitting back down onto the ground, this time eating only one pellet at a time, picking each one daintily with his claws before chewing and swallowing. Thankfully, they dis not seem to think twice of his behavior, apparentally, as the Wingull paused in his eating to ask a very simple question. Zoroark nodded in understanding, his eyes sympathetic as he turned to look at the water type. He always thought it was rude not to face one that you were talking to. And he could not disrespect the birds anymore than he had. "I am merely traveling," Zoroark told the group, his intelligant gaze sweeping over them all as he spoke. "I am still trying to get over the loss of... Of my trainer. I wish to help those whom need it, living and surviving in what our world has become is the best we can do now." His bright eyes turned down as he spoke, studying the human object around his wrist. He felt another pang run through his chest, different than the hunger, and he had to fight the terrifle greif and flow of emotions that threatened to wash over him like they always dis as he thought of N. The Zoroark's thick claws wrapped tightly and protectively around the necklace balanced upon his palm as he lifted his head to regaurd the others as he awaited their responses, too. Pidove looked up from where he was and looked at the new bird, he didn't know what it was, then he didn't know what much was. He just smiled and listened to Talon introduce themselves, then another face came to join. It was big, and Fluffy! "Fluffy!" Pidove chirped, his wings outstretched as he looked up at the fox pokemon. He flapped his wings and flew up to it where he then perched himself atop the Zoroarks head, stretching his wings out again. "Fluffy!" He said with a big smile. He folded his wings and made himself comfortable on top of the fox pokemons head, if birds could purr, Pidove would most definitely be doing so right there. It only took a moment for the Zoroark to answer, albeit the answer was very downcast and sullen. He spoke over the grievance of the loss of his trainer, and how he now travels the land, helping those who are in need of it. “Very honorable, Zoro.” Quinn imagined the pure dark type in shining armor, as the knights in the fantasy novels that he often read. What a valiant effort this lllusion Fox was taking towards the end of this epidemic! If only I myself could be that strong to defend others. Yes, the Wingull had no such strength whatsoever to help those around him; he could barely help himself as the days went by in solitude. Ruffling his feathers, Quinn watched with interest as the others dawdled about in their own little ways. After a while the Pidove looked up to Zoroark, its huge eyes focusing on the fox. “Fluffy!” The little bird spoke jubilantly, fluttering up to the Zoroark’s head and plopping down upon him as if there was no other problem in the world. Quinn chuckled softly at this, finding how innocent Pidove was very endearing and heartfelt. He just proves to show that this world still has hope left within it. The humans having broke the natural law of the universe, going against the flow of nature, had mercilessly backfired, causing the catastrophic epidemic to rage the land. Many Pokemon that he had met blamed this entire pandemic on the humans, condemning them for their foolishness. But Quinn himself did not blame the humans for this, because for their mistake it had been their death. The Wingull had not seen a living human for so long, and sympathized with the human race for the cost they had paid for their own expense. Some things are just not worth the pointing fingers. Pinning the blame on something you can’t change was useless, the Wingull thought bittersweetly as he watched the entirely innocent scene between Zoro and the Pidove. It was a rare sight to see a nidoking cry. The great purple dragon stood in silence, staring down at the freshly buried grave with tears running down his broad face. A makeshift, wooden cross stuck out of the earth, the name ‘Ellie’ almost ineligibly engraved onto the material. It had been a tense hour, but Arthur had managed to bear the news of his trainer’s death with his partner’s support. The nidoqueen stood by his side, her head resting on his shoulder, an arm hooked protectively around Arthur’s own as the pair brought their mourning to an end. With a deep exhale, the nidoking forced a weak smile whilst turning away from the grave, Molly copying his movements as the pair made their leave. There was nothing to be said. It was unfortunate that their old trainer had fallen victim to the epidemic, but sadly, they lacked the skill to turn back time. All they could do was hope that she was in a better place. Arthur had no doubt she would be. “Now what, dear?” Molly asked, looking up to her mate. She hadn’t known Ellie quite as well as Arthur, but the human had been kind to her nevertheless. Without Ellie, she’d have never met her beloved Arthur – she’d probably be rotting in an alley, beaten and tired from her past treatment. She shook away the thought before it could engulf her attention. “We survive. It’s what she would have wanted...” Arthur met his mate’s gaze, his own eyes moist as a smile found its way to his face. You survive, was what he meant to say, but she’d only get herself in a state over the idea. Nothing was going to hurt Molly - that was something the nidoking could guarantee. He gave her hand a squeeze, shaking away the heartbreak that had accompanied Ellie’s death and mentally announced his dedication to protecting his mate, and his mate alone. As they exited the dilapidated home that they’d once inhabited, the faint echoing of voices came to Molly’s attention. She stopped abruptly in the doorway, alert and straining to catch the slightest sounds of speech, or movement. Arthur was oblivious. He wiped his face with the back of his arm, removing any evidence of tears before finally noticing how tense the nidoqueen had become. He frowned, concerned as he gently nudged her with his arm. “S-Sorry... I thought I heard something,” Molly finally admitted, forcing her attention back to her mate. She persuaded herself it was nothing – perhaps the epidemic was simply taking its toll on her. She wasn’t as young as she used to be, and with all sorts of horrors on the loose there was no telling when she might begin to lose her marbles. She smiled up at Arthur whose expression had hardened slightly. “Shh, nothing to worry about, dear,” She tightened her grip on his hand as they emerged into the deserted streets of Hearthome City. It certainly wasn’t as it used to be. If the collapsing buildings and occasional splatters of blood wasn’t enough, the lingering scent of decay was bound to ward off any survivors. Molly hated it. She subconsciously moved closer to Arthur. Arthur came to a gradual halt at the sight of a small gathering of creatures near the town’s pokémon centre. His wary expression soon developed into one of shock as he observed the group. Mainly birds accompanied with a large, fox-like creature; but most importantly, they seemed healthy. Molly had seen them too. “Arthur? 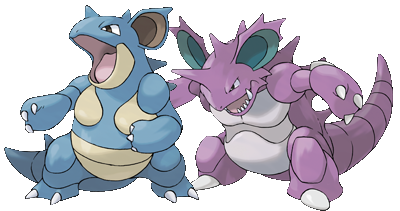 Are they...?” The nidoqueen looked between her mate and the group, disbelieving what she was seeing. They hadn’t seen anything living in weeks; the sight of four survivors was enough to stun the pair into a silent awe. As realization kicked in, Molly began to giggle, her free hand covering her mouth as her face lit up. “Hello there!” The nidoqueen called, her voice melodic as joy established itself over both her expression and speech. She raised a large, blue hand, waving it to the creatures, before turning to look at Arthur, a rarely seen excitement surfacing in the nidoqueen. Arthur was smitten. He hadn’t seen this side of Molly in a good while – it was a pleasant change which he’d almost forgotten. However, it was contagious. If Molly was happy, then he’d gladly follow her example. They began walking towards the small group, Molly letting go of the nidoking’s hand as she trotted ahead, beaming down at the pokémon. On closer inspection, she noticed that the bird sitting atop the zoroark’s head was particularly young, excited to be inhabiting the creature’s mane. Her heart melted, eyes softening into longing as her maternal desires kicked in. Arthur was so disinterested in parenthood when all she truly wanted was a child of her own. “It’s certainly a surprise to meet other survivors,” Arthur had appeared at Molly’s side as the female finally forced her attention away from the pidove. She shared her mate’s smile, moving to wrap her arm around his waist once more. “It’s a pleasure to meet you all,” Arthur was always notoriously polite. Even given the circumstances, he couldn’t resist offering the strangers a slight bow. Molly shook her head at his actions, chuckling lightly. “My name’s Molly. That idiot’s Arthur,” He would have offered his hand had not the majority of his audience been birds. “We're not as scary as we look, honestly!” The both chuckled again, used to the stereotyping of their species. The skies above Hearthome City were clear and somewhat beautiful as Mayura dove down towards a group of Pokemon near the Pokemon center. Instinct told her they were living and well and she welcomed the thought that some of them were flying types like herself. Gliding down, she rested on the ground and folded her wings into her sides and stayed away from the others wondering if she should approach. Quinn had taken in the peaceful view of having others - living others - so close in proximity, to have them speak and know of your company. It had lifted an unknown weight off of his wings, and suddenly the Wingull could finally see the world as if a light switch had been flipped on. Very beautiful indeed. He chirped in his mind, hopping away from the bag of Pokemon food and towards the others. Quinn had not realized how much he needed the company of others until he had been given such after so long of an isolation; the breathing Pokemon beside him was a greatly appreciated gift aside from all the other depressing topics and lore about him nowadays. The Seagull Pokemon looked on with happy eyes, before noticing that two large dinosaurs hunkered their way into the Pokemon Center. Quinn widened his eyes in spectacle, flying his way back to the counter and landing softly. Who were these large Pokemon, and why were they here? I suppose that could go for all of us, so question aside. The bird flapped his wings in mild surprise as they introduced themselves jovially, even bantering with one another as if they were an elderly couple. With that image surfacing in his mind, Quinn began to relax at the sight of the humongous pair of dinosaurs, breathing a small sigh of relief. He truly detested fighting, and frankly, would like to avoid it at all costs. "I'm Quinn, welcome!" The Wingull spoke, bowing slightly. He particularly liked how the Nidoking was so large in size, yet so respectful and kind, while the Nidoqueen too was heavyweight, but her demeanor was motherly and completely amicable. A very interesting pair. The little Pidove had named himself to the Nidoes as well, and Quinn took great pleasure in how the little bird knew straightaway to introduce himself - a good sign that the little tyke is thinking! Tucking in his wings, the water type noticed a fluffy cloud of a Pokemon in the near distance. Something was nearby, just out of their reach. Taking the initiative, the Wingull drifted off the counter and towards the entrance of the building, landing atop Arthur's head (muttering a quiet 'excuse me'). Now that he peered closer, Quinn could make out blue body parts of the Pokemon, attached to the cloud. It's an Altaria! Now seeing that this bird wasn't bloody or missing any parts, he assumed that it wasn't infected from the ever-looming epidemic. "Altaria, miss, what are you doing by your lonesome?" The mood seemed to have been brought down by the Zoroark's words and he regretted it very quickly, even after the Wingull had complimented him on being 'honorable'. Zoroark's ears burned. He was anything but. Talon made no move to speak about his past but that may have been merely because he did not wish to talk about it. Either way, having Zoro being the only one besides the wingull to speak made it a little awkward for him. The Illusion Fox pokemon shuffled his thumbs as he glanced around the room. He had given up on eating- he would only make his stomach hurt from ingesting too much. Zoroark wished that his beloved birds would make up some other way to ease his tension. And so they did. Pidove, the fluffy little baby must have not been paying attention to when Zoroark had entered as he had quite a reaction to him when he did. The little bird started chirping,"Fluffy! Fluffy!" Zoroark gasped in suprise, rising quickly to his feet as the grey bird might as well have dove at him! Zoroark's eyes widened in suprise- Was Pidove honestly attacking him?? - but he quickly realized that there was no need for fear. Pidove merely fluttered happily to the top of his head and Zoro could only assume that he was making a nest in his hair-like main, as he could not see the Pidove anymore. Zoroark then beamed, his canine maw opening slightly to reveal sharp teeth as he grinned gleefully. "L-look!" Zoroark adressed the wingull, as he seemed the most social. "He just- Pidove just-! Oh my, he is merely so adorable!!" Zoro had a tough time getting the words out he was so honored and overjoyed. The dark type seemed to glow, he felt so happy. Zoroark slowly sat back down on the ground by Talon, careful to not let Pidove fall from his head. He reached up with one hand and felt around his head until he brushed Pidove. Zoroark gently stroked his downt feathers with a long, curved claw. This was the best he had felt since he lost N. However strangest thing pulled him from his joyous haze of the bird: He heard two voices! “It’s certainly a surprise to meet other survivors," A male voice called. Zoroark whipped around, his fur suddenly spiking up if he proved to be a threat. But, alas, like the oice sounded, he was met by two alive and well pokemon. And two he knew well! A Nidoking and a Nidoqueen. As they entered the building with them, Zoro allowed his bidy to relax, but standing up to be polite. “It’s a pleasure to meet you all." Zoroark watched with delight as they mirrored his bow. They would prove enjoyable to be allowed indeed. “My name’s Molly. That idiot’s Arthur." Zoro smiled, nodding to them both in turn. "Greetings friends! Molly, Arthur, my name is Zoroark. And this is Talon," he added, motioning to the Murkrow. He bowed again to them, making sure to not let the sacred Pidove fall from his head.“We're not as scary as we look, honestly!” Zoroark just couldn't stop grinning! His lips pulled back to show off his teeth as he beamed at them. So respectable! "Nor I, friends! I promise that I am nothing like the sterotype of my own species." Zoro watched as the Wingull fluttered to a new perch upon a Nido's head, seeming to look outside. Zoroark tilled his head slightly. "Something wrong, Wingull?" He asked polietly. The pokémon were all friendly and welcoming enough, even the young pidove offering its name in a manner that melted Molly’s heart. The couple beamed kindly, their eyes drifting to each speaker as they introduced themselves, all polite, all happy. It was strange seeing such joy in an otherwise bleak world. Strange, but an emotion neither nido wanted to argue with. Happiness had become precious in the epidemic. Arthur bowed his head again lightly once the formalities had come to a halt with the Zoroark. It was odd that he didn’t have a ‘proper’ name. He could understand Pidove’s situation, albeit a tragic one if his thoughts were correct, but the only explanation he could find for the zoroark was that he’d been wild all his life. If it were true, he pitied the canine – he couldn’t imagine life had he not met Ellie. Molly smiled at the Zoroark concerning stereotyping. "Nor I, friends! I promise that I am nothing like the stereotype of my own species." “Take a minute to breathe, love,” Arthur chuckled, resting a paw on her shoulder. When Molly got talking, she could go on for hours regardless of whether anybody was actually listening or not. She elbowed the nidoking playfully, knowing that he was right but reluctant to admit it. “It’s best not to get her started,” The nidoking was quickly drawn from his teasing advice when a light weight suddenly landed on his head. He hardly flinched. The pokemon was so used to carrying other, smaller creatures that he rarely bothered to react; in fact he quite liked assisting others with his size. The wingull even muttered a quick apology. "Altaria, miss, what are you doing by your lonesome?" Arthur didn’t want to surprise Quinn by spinning around to face the stranger currently being addressed, so he waited, straining his eyes in a vain attempt to look behind him. His attention drifted to Molly whose eyes had lit up, before her form disappeared from his vision. “Goodness! Come in, come in!” Molly cried, trotting out of the building to welcome the altaria into the pokémon centre. Arthur heard every word, rolling his eyes at his partner’s enthusiasm. ”Molly, darling, remember you don’t own the place,” He hoped the gentle reminder would settle her slightly. She had a habit of assuming authority in a group, taking on the role of ‘mother’ when it really wasn’t necessary. Pidove was about half buried in the Zoroarks hair, only his little head was really visible as he looked at the new pokemon, a huge smile on his face as he looked at them. They where huge, and menacing looking, but Pidove found them to look cute. "Cute." He chirped as he looked at them. Not knowing if they knew he meant them or not. He though everyone he met was cute, and he really likes Fluffy's fur, it was so soft and warm that he didn't want to leave it. When the Altaria seemed to shy away (he wasn't sure - Quinn cursed his horrible nearsighted eyes), Quinn shrugged. There wasn't much that he could do if she didn't wish to come in right away. "We won't hurt you - but you can enter whenever you'd like, I suppose." The Wingull turned around on the Nidoking's head, glancing down to the dinosaur's giant eyes, before looking at the Nidoqueen and cawing in pleasure. It was admittedly a chilly morning, but right here, in the midst of so many welcoming Pokemon, it almost felt as if he were settling in front of a fireplace, the warmth of friendship wrapping around him like a blanket. The Wingull flapped his wings, rather liking his position atop Arthur's head. It had been a long time since he had found himself a stand point such as this, reminding him of the trainer he had abandoned. Quinn closed his eyes in thought, reminiscing of what a sick cavalier he was, fleeing while his human friend was mostly likely being torn apart. The Seagull Pokemon sighed, opening his eyes in undisclosed hurt. He had allowed his friend to die so easily, and for that he has been a disgraced Wingull. Unworthy. That's what I am. Quinn settled on Arthur's crown, wishing the epidemic had not brought so much hurt and loss into the world. Although it wouldn't be much of an epidemic if it were as such. The bird brought his attention towards Zoro, and the little Pidove that resided upon him. How innocent the other bird was, how naive he was towards the growing pandemic. Innocence is a powerful thing. Quinn quoted from a book he had once read, and he had never realized how true that statement was until this moment. The Pidove was growing up in a world where he knew only of fighting and killing, Quinn realized with a jolt. How exactly will he be as he grows up? Can the Pidove truly imagine a world where it was peaceful, and Pokemon could actually sleep peacefully? Quinn watched in silent reveries the little Pidove, wishing in all the world that there was something he could do to help the infection end and thus bring a better future for the bird. But things like that only happen in storybooks... The Wingull pressed his wings closer to his body, suddenly finding that the world had become much colder than before. “Goodness! Come in, come in!” The Nidoqueen called out, her tone bordering a distressed parent. Zoroark chuckled in good nature as Arthur rolled his eyes at her. ”Molly, darling, remember you don’t own the place,” He told her, but Zoro could tell that he wasn't trying to repramand her and she quickly responded with a ”Oh hush up." The dark type moved forward to see what they were actually seeing, all too awear of the precous bundle in his mane. He was able to get past the Nidoking's great- er- gurth with a polite nod and a soft, "Pardon me," and saw what everyone was making a fuss about. ”Come on, dear. Let’s get inside, hm?” Molly was motioning for their newest companion to join them and Zoro's eyes lit up and he gasped loudly. He most likely would have dropped to his knees and started bowing had Pidove not been on his head. It was an Altaria! The DRAGON flying type. He had only seen them in books. As it was, Zoroark moved out and quickly addressed her. "Oh my!! Hello miss! Molly is right, please do come in! It can be quite dangerous out-" His voice was cut off with a loud cry and Zoro looked up in horror to see a pokemon from his region flying high above but coming closer. His bright eyes went wide with horror. It was a hydreigon, and it was closing in fast. Zoro growled, low and deep in his cheat. He knew how to deal with it but first he needed to get his companions out of the open. His whole demenor changed, Zoroark stood up tall and proud, his ears flicking to keep track of the monster, and his eyes were narrowed and hard. "Quick! Everyone get inside!" he commanded with authority. He didn't know if anyone had real fighting experiance but he could deal with it by himself. Zoro glanced up at the sky. It was too far away to even make out any real features, but it was circling above them. He cursed silently. "I can deal with it for the most part but I may need back up," I explained as I rushed Molly and the Alteria to the safty of the pokemon center. "Sorry miss, you came at a bad time," I apologized softly to her with a tired smile. we only had a minute or two before the thing would dive and I would jump into battle for these souls that needed protecting. Arthur tensed at the canine’s outcry, momentarily forgetting the bird atop his head and spinning around to face the building’s exit. Startled, almost fearful of the sudden announcement, he took a few steps towards the entrance as Molly and the stranger retreated at the zoroark’s warning. Now that he could see the newcomer, he recognised the species as an altaria, beautiful creatures, and he ushered a weak smile as she neared. Molly had instinctively followed the canine’s orders, trotting back to the pokémon centre, an arm still hovering about the altaria’s back. She hadn’t even thought to examine the danger, but trusted Zoroark’s warning regardless. His tone and stature had instantly changed; his body language alone confirmed that the situation had taken a nasty turn. "I can deal with it for the most part but I may need back up,"
The nidoqueen stopped, suddenly remembering the young pidove nesting in the zoroark’s mane. Eyes widening, she emitted a sharp gasp before spinning on her heel back out of the building. “Not yet you won’t,” She muttered, rapidly closing the gap between herself and the canine. Like an insistent mother, she lightly pressed down on the canine’s shoulder in attempt to lower his head. She found herself too short to reach Pidove now the canine stood at his full height. “Come on, puppet,” The nidoqueen smiled pleasantly, holding out a large, blue paw for the young bird. She momentarily turned her attention to Zoro, following his gaze into the skies. The dragon was huge, and it terrified her. “Must you fight it?” She asked quietly, concerned. Molly never endorsed violence – she’d put her battling years behind her and made an effort to minimize unnecessary fighting. However, in a life or death situation, Molly would fight till the end. Arthur trudged out into the open, ducking slightly so that Quinn wouldn’t be knocked off his head as they exited the building. He glanced to skies, an almighty dragon patrolling the perimeter. His eyes narrowed slightly, annoyed that this monstrous creature had to intrude on such a peaceful gathering. “I can help,” The nidoking told Zoro bluntly, his heavy tail swishing in anticipation. Like his partner, he too wasn’t a great fan of fighting, but in recent times, it had become a necessity. Besides, he couldn’t let the canine face that thing alone. Arthur was getting old, but he was powerful nonetheless. “You be careful, Arthur,” Molly grumbled, disguising genuine concern with a hint of anger. “You’ve got nothing to prove, dear,” She spoke at a lower level, not wanting to humiliate the male or bring attention to his age. “I’ll be fine, love. Just keep yourself safe,” The pair nuzzled their noses together, just in case the worst were to befall either of them. They were a rational couple; they knew the dangers of this new world, and as much as the idea disgusted them, they had to be ready for the loss of life. They just had to make the most of what was left – each other.